With holiday boat parades in the rear-view mirror, boaters can look forward to celebrating the beginning of 2013 aboard their vessels, as fireworks shows in Long Beach Harbor and San Diego’s Mission Bay will give boaters a front-row seat to the entertainment. In Long Beach, two fireworks shows are planned, starting with an East Coast-time New Year’s Eve kickoff fireworks show at Rainbow Harbor. The 10-minute show will start at 9 p.m.
Shoreside spectators can take part in the family friendly Waterfront New Year’s Eve celebration taking place at the downtown Long Beach waterfront amphitheater. The event features live bands performing music, along with roaming performers — such as magicians, face painters and balloon artists — and other activities suitable for the entire family. The event begins at 5 p.m. Dec. 31. After the 9 p.m. fireworks, the party moves to Pine Avenue, where the festivities will continue with dancing in the street until the West Coast New Year begins. For more information on the Long Beach New Year’s Eve festivities, call (562) 436-4259 or visit dlba.org. 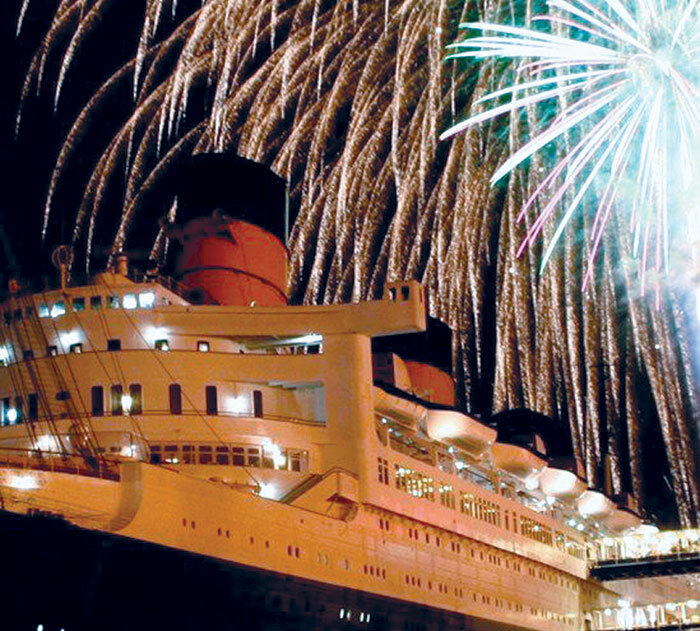 For those looking to celebrate in style, Queen Mary is hosting its annual New Year’s Eve celebration, with fireworks scheduled to go off at midnight. General admission tickets start at $109 and include admission aboard the ship, onboard entertainment, New Year’s Eve party favors and the best view of the midnight fireworks show. Live music acts planned this year include funk, soul, disco, jazz, blues, swing and rockabilly artists, along with multiple DJs performing through the night. For more information on the Queen Mary New Year’s Eve party, call (877) 342-0738 or visit queenmary.com. In San Diego, boaters can head over to Mission Bay to watch SeaWorld’s annual “bedtime friendly” fireworks show the whole family can enjoy — at 8:50 p.m. In San Diego Bay, the former annual New Year’s Eve fireworks show put on by the San Diego Port Tenants Association has been cancelled again due to environmental permit issues. But those looking to enjoy a night on the bay can board the aircraft carrier USS Midway museum for a New Year’s Eve Gala that includes an open bar, a dinner buffet and dancing to the live music of the Big Daddy Orchestra. The event is scheduled from 8 p.m.-1 a.m. and costs $169 per person. For more information or to make reservations, call (619) 575-5500 or visit peartreescatering.com.